In June, approximately 100 researchers attended a workshop on the campus of the National Institutes of Health (NIH) in Bethesda, MD, about an important but underappreciated side effect of some treatments for cancer: heart problems. Certain cancer treatments can damage the heart and the cardiovascular system. These side effects, including high blood pressure, abnormal heart rhythms, and heart failure, can be caused or exacerbated by chemotherapy and radiation therapy, as well as by newer forms of cancer treatment, such as targeted therapies and immunotherapies. “Cancer therapies affect a number of organs and organ systems, including the heart,” said Saro Armenian, D.O., M.P.H., at the meeting. Dr. Armenian, who treats children with cancer at City of Hope Comprehensive Cancer Center, noted that when a patient develops cardiac side effects during treatment, a doctor may modify the dose of a therapy or stop the therapy altogether. Some cardiac side effects, however, go undetected for years or even decades after a patient’s treatment has ended. “Patients diagnosed with cancer are living longer today than in the past, and many of these survivors are living long enough to develop late cardiovascular effects,” said Lori Minasian, M.D., deputy director of NCI’s Division of Cancer Prevention, in an interview. 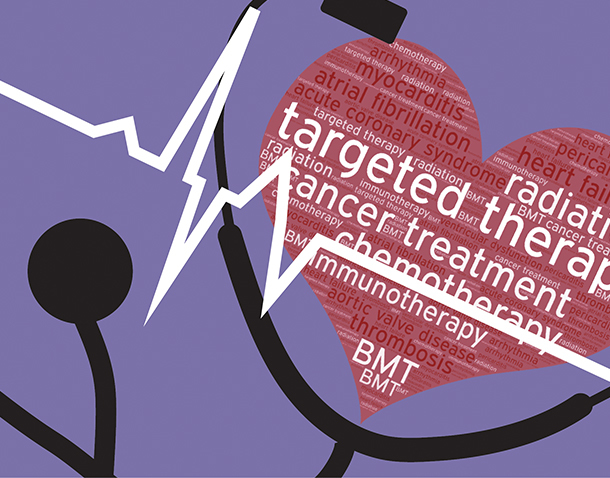 In recent years, Dr. Minasian continued, researchers have begun systematically to document the longer-term cardiovascular side effects of cancer treatments, also known as cardiotoxicities. At the workshop on improving outcomes in treatment-related cardiotoxicity, participants from government, academia, and the private sector identified gaps in current knowledge and discussed priorities for future research. NCI and the National Heart, Lung, and Blood Institute (NHLBI) cosponsored the meeting. 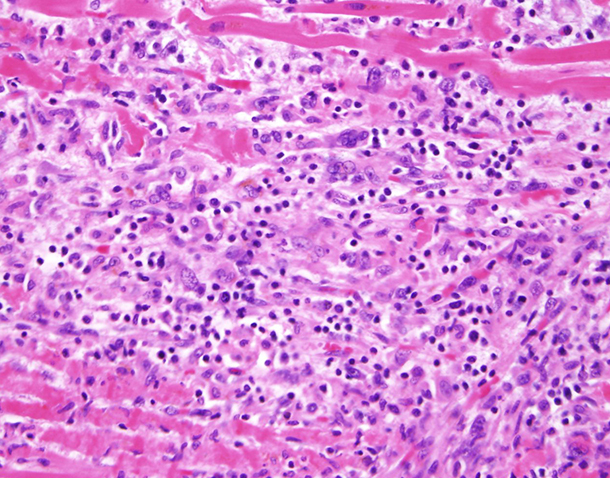 Heart tissue from a patient treated with an immune checkpoint inhibitor showing T cells (blue dots) invading muscle fibers in the heart. The workshop highlighted a challenge for the field, which is known as cardio-oncology: identifying and investigating cardiac side effects that are associated with a rapidly changing landscape of cancer treatments and combinations of therapies. For example, as more and more immunotherapies have entered the clinic in recent years, researchers have begun to detect specific cardiac side effects that can occur during treatment with some of these agents. A recent study showed that a small percentage of patients who receive immunotherapy drugs called immune checkpoint inhibitor develop inflammation of the heart muscle known as myocarditis. In this study, about half of the patients who developed severe myocarditis died of it. While research on myocarditis from checkpoint inhibitors has “created a buzz,” many other cancer therapies can cause cardiovascular adverse events, he noted. Susan Dent, M.D., who codirects Cardio-Oncology at Duke University, agreed. Doctors and patients, she noted, need information about the potential cardiac side effects of cancer drugs when these agents enter the clinic. “We don’t want to wait until a decade has passed and then design a study to learn about the cardiotoxicities associated with a cancer drug,” she said. To illustrate the serious nature of cardiotoxicities and to put a human face on the issue, several speakers at the workshop shared the stories of individuals who died prematurely of heart problems related to cancer therapies, including Ellen Stovall.A prominent advocate for cancer survivors who served on an NCI advisory board, Stovall had been treated for three different cancers over many years. Some of the therapies led to chronic health problems, and about 2 years ago, at the age of 69, Stovall died suddenly. The cause of her death was complications of cardiovascular disease related to her cancer treatments. Another example discussed at the meeting was a woman who developed heart disease related to treatments for multiple cancers that led to emergency triple-bypass surgery. She died at age 47. “We cannot cure patients of one cancer, only to have them develop a second cancer and treatment-related cardiac problems that result in a triple bypass” before age 50, Dr. Dent commented. More research is also needed to help inform clinical decisions about cancer treatments and cardiac side effects. “Oncologists and cardiologists want to be able to implement evidence-based guidelines for patient care, but more studies are needed,” said Dr. Minasian. Chau Dang, M.D., a medical oncologist at Memorial Sloan Kettering Cancer Center, summarized the critical questions as “who, when, and how.” That is, who should be monitored for cardiovascular problems, when should they be monitored, and how should they be monitored? The workshop included discussions of biomarkers of cardiac or cardiovascular damage, such as troponin, which is a complex of proteins that is released when heart muscle is damaged. These biomarkers were developed for patients with heart disease rather than for patients with cancer who may experience treatment-induced cardiac side effects. As a result, it’s not clear whether biomarkers of cardiovascular damage could be used to assess the risk of cardiac side effects or to monitor cardiovascular health in patients being treated for cancer or in long-term survivors. “We don’t know if the patterns of injury from anti-cancer drugs are the same as the patterns of injury of de novo heart disease,” said Dr. Minasian. Nonetheless, several speakers emphasized the need to establish the usefulness of biomarkers for assessing whether patients are experiencing cardiovascular damage from cancer therapies and how such biomarkers should be used, particularly given the existence of other tests, such as imaging tests. “Right now, it’s not clear which combinations of biomarker and imaging tests should be used for which patients and when,” said Dr. Dent. At the workshop, several participants also stressed the importance of learning more about how cancer treatments may harm the cardiovascular system. This information could be used to develop much-needed research tools, such as better ways to predict which patients are at risk of developing cardiac side effects as well as strategies for reducing this risk, Dr. Dent noted. Large clinical trials that follow patients over time would allow researchers to gain insights into how and when longer-term cardiac side effects develop, Dr. Armenian noted. Over the past decade, breast cancer has been a focus of research on cardiac side effects, in part because certain treatments for the disease are known to cause these side effects. Based on this evidence, the American Heart Association recently issued a rare scientific statement on cardiovascular disease and breast cancerExit Disclaimer. For some breast cancer survivors—older individuals in particular—the risk of dying from cardiovascular disease may exceed the risk of dying from cancer, the authors of the statement noted. Dawn L. Hershman, M.D., who studies breast cancer at the Herbert Irving Comprehensive Cancer Center at Columbia University Medical Center, agreed. “The reality is we’ve made a huge amount of progress in treating breast cancer, and today women diagnosed with early-stage breast cancer are more likely to die of cardiac disease than of cancer,” she said in an interview. Researchers are using zebrafish to study how the cancer drug doxorubicin affects the heart. Normal fish (left) and a fish that developed cardiomyopathy after treatment with doxorubicin (right). Although some breast cancer treatments, such as HER2-targeted therapies, doxorubicin, and radiation therapy, are known to cause cardiac side effects, other factors can affect a patient’s cardiovascular health as well, Dr. Hershman pointed out. The dual risks of cancer and heart disease in cancer survivors have created a challenge for both oncologists and cardiologists, noted Dr. Minasian. “The question is, can we manage the risk of both diseases to help people live healthy and productive lives?” she said. The goal, she explained, is to understand a patient’s risk of cardiovascular disease when cancer is diagnosed and then to manage that risk throughout the treatment for cancer and beyond. If a patient already has cardiovascular disease, then the disease would be managed along with the cancer, Dr. Minasian added. With an aging US population and continued advances being made in cancer care, some researchers warned that cardiotoxicities are likely to become a larger concern in the coming decades. Yet, several speakers noted that many of their colleagues in cardiology and oncology were generally unfamiliar with the cardiac side effects of cancer treatments. Patients and survivors need to be informed as well, added Dr. Minasian, noting that collaboration among researchers will be critical to making progress against cardiotoxicities. “We need cardiologists and oncologists to work together to answer basic questions about cardiotoxicities that neither group could answer working alone,” she said. Some hospitals and cancer centers have developed multidisciplinary teams to facilitate the treatment of patients with cancer while mitigating the risk of cardiac side effects.At the University of Texas MD Anderson Cancer Center, for example, Cezar A. Iliescu, M.D., is part of a new field known as interventional cardio-oncology. These physicians and researchers specialize in complex procedures that allow patients who have both cancer and heart disease to receive the cancer treatments they need. The MD Anderson researchers have been publishing their results, including a review of the clinical management of acute coronary syndrome in patients with cancer.